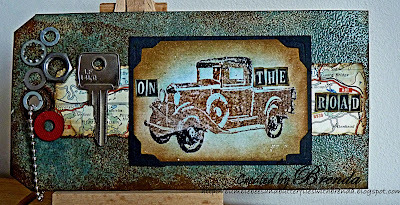 Yay I have managed to get a tag done that has been inspired by both the rusty embossing background from the fab Tim Holtz for Grungy Monday and the Chestnut Theme challenge at Gingersnap Creations called On The Road. You can find the explanation for the rusty embossing background HERE on Tim's blog where he shows how he has used it with a Christmas tag. There are some fabulous pieces as inspiration by Linda, the lovely hostess and two fabulous guest designers Barbara and Rinda. Mine has the car, map and a bit of the nuts and bolts as Gingersnap's overall focus for the month is Steampunk and you know me I love to play in this genre. 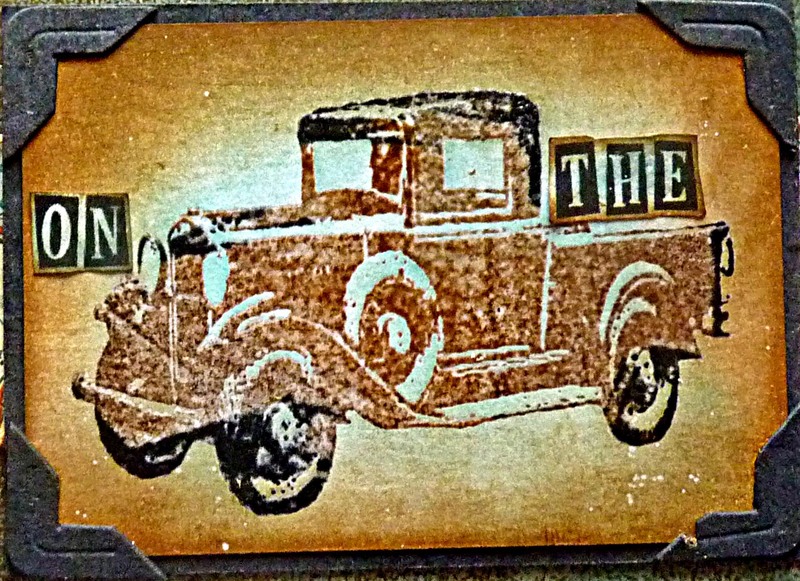 This looks out of focus, but the glossy embossing hasn't helped on the truck. But you can see how I have added the journalling. TH die ATC and corners. 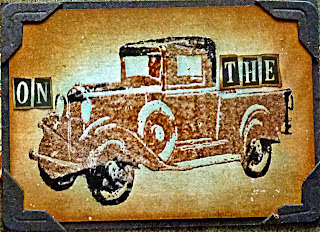 DIs - weathered wood, vintage photo, frayed burlap, walnut stain and black soot. Old book of AA maps and bits from my oddments box. Have a good day and thanks for stopping by to have a look at my tag today. This is brilliant, Brenda....will take a look at the TH link...hope to learn something else than my normal cards...! You've excelled yourself against Brenda! Great to see you continuing to play along with us at Gingersnaps! Love the look of the rusty embossing, might have to check that out, brilliant tag as usual Brenda. 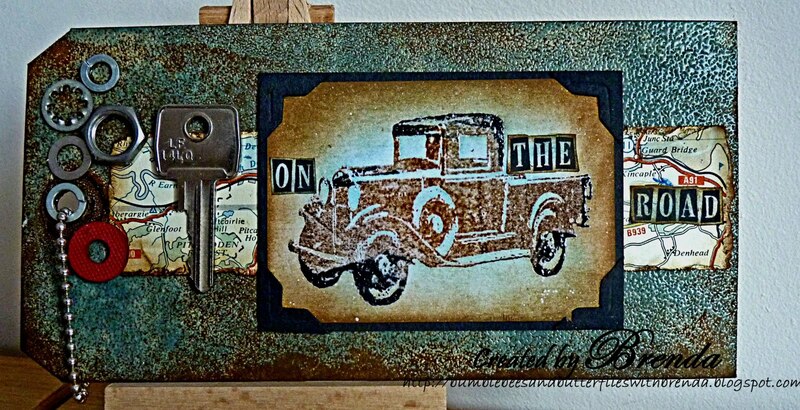 Just fabulous Brenda and I really love the rusty effect with your road trip theme. A perfect match! Looking good! The embossing effect worked out great! Next time you replenish your stash, better get hubbie to do the same. (lol) But wait, they always have more stuff than us, no? Ooh love this Brenda! 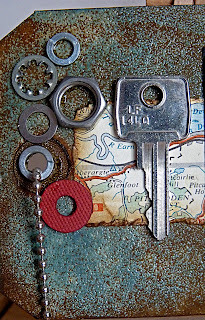 Lovely vintage feel and great design - love the stamp and the keys etc. lots of lovely textures!! Love the tag. You did a great job on the technique as well as incorporating all those other challenges. The truck is perfect. Only just realised you've entered this is the Make My Monday challenge and it's lovely to see you there. Hope you can join in again as I think you'll like the next one! 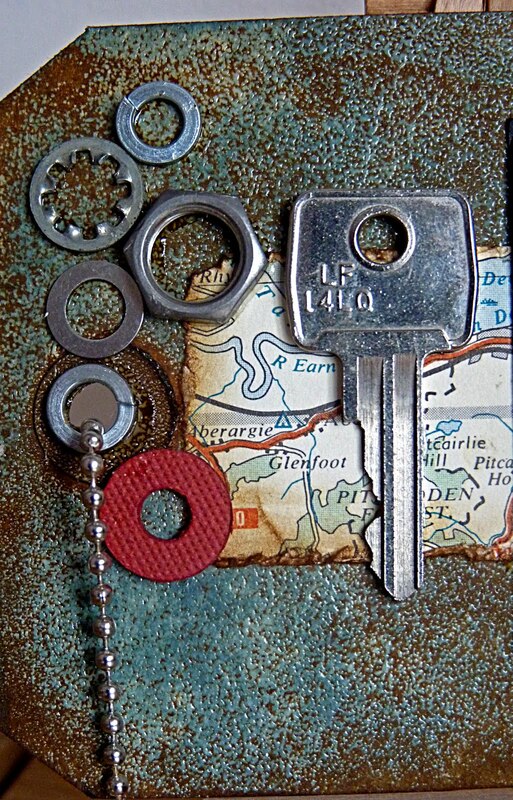 Wow, that's a fabulous tag, love the background and the use of all these metal elements. This tag is full of masculine-ness! What a terrific tag! Thought I had left a comment yesterday but it isn't there!! Love this tag Brenda...especially the nuts and washers ~ and the colours on the rusty effect really finish off the maleness of the tag. The colors and map are brilliant. I love the details of the nuts and bolts with the vehicle key too. Super job! Wow fabulous piece all lovely and rusty and grungy gorgeousness.